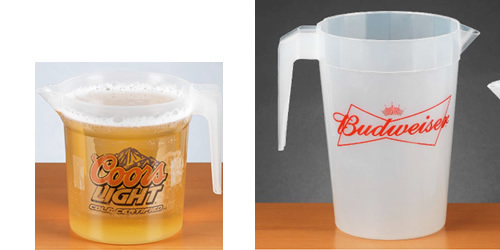 These Custom Plastic Pitchers are perfect for bars, restaurants, clubs, fraternities, sororities, promotions, and much more. 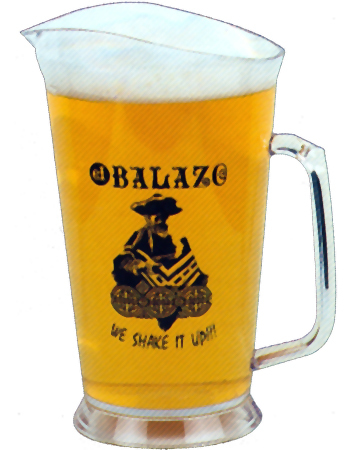 Our Imprinted Plastic Pitchers are made in the USA of either Durable Styrene Material, Glass-Like Polycarbonate Resin that is compliant with California Proposition 65. Your satisfaction is guaranteed when you order Custom Drinkware from us. P3240 32/40 oz Pitcher 4.95 4.69 4.49 4.25 4.09 3.99 2½" 4"
PS60 60 oz Serving Pitcher 5.75 5.49 5.29 4.65 4.55 4.45 2.5" 4"
PS60/70 60/70 oz Pitcher 4.99 4.75 4.55 4.35 4.19 4.09 3" 4"
632 32 oz Pitcher 3.75 3.65 3.40 3.30 3" 3"
685 2 Liter Safari Theme Pitcher 9.85 9.76 9.67 9.49 9.40 4" 4"
PMJ32 32 Oz. Plastic Mason Jar Pitcher 5.95 5.69 5.39 4.97 4.79 4.59 2.5" 3"
Additional Color Imprint: .80 .70 .60 .55 .50 .50 2.5" 3"
6481PR 48 Oz. Custom Plastic Stackable Pitcher 2.09 1.89 1.83 1.77 3" 3"
6641PR 64 Oz. 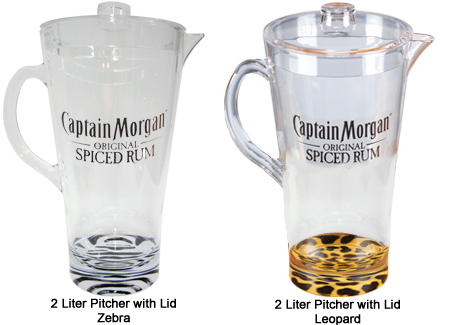 Custom Plastic Stackable Pitcher 2.49 2.25 2.19 2.13 3" 3"
To order Custom Imprinted Plastic Pitchers, please call 1-800-233-0828 and then e-mail us your print-ready artwork. Production time is about three weeks. Rush production/delivery is available for an additional charge. 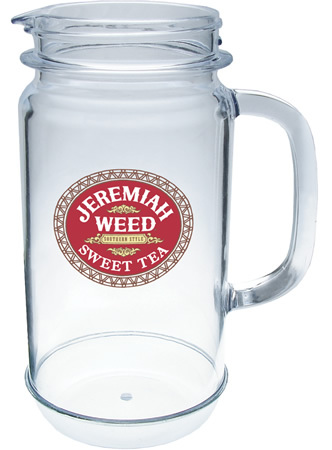 For additional information on our Custom Imprinted Drinkware, please contact us at 1-800-233-0828.